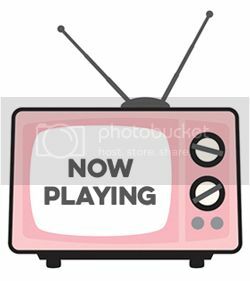 Welcome to the DeNami Blog/Instagram Hop (#BIGDDHop) hosted by DeNami! DeNami will be giving away a $50 gift certificate on the Instagram Hop and a bonus $20 on the blog hop! Be sure to join both for more chances to win! To enter the blog $20 giveaway, you must go to each blog and comment on each of them. You will be given the next stop. It should make a loop and you will end up back here. You should have come from Elizabeth's blog here. For my card I first created a background using watercolour paper and Peerless watercolours. I added water to my watercolour panel and just dropped on the colour with a paint brush until I had it the intensity I wanted. While it was drying I stamped the coffee cup and donut image onto white cardstock and coloured them in with Copic markers. I then cut them out and adhered them to the watercolour background with foam adhesive. I stamped the sentiment onto a black piece of cardstock and heat embossed it with white embossing powder. I cut it into a strip with my scissors and adhered it directly below the focal images. To complete my card I added some clear sequins (wuiith silver stickle centers) for some added detail and dimension. For more added fun, join the hop on Instagram and enter to win a $50 gift certificate from DeNami. The hop begins today and will go on until Friday, March 25th. A winner will be announced on Friday, April 1. The Instagram profiles are listed below. Start at DeNami page and click the picture to know where your next stop will be. The list is below in case you get lost. Thanks for hopping in the DeNami Spring Fling Blog/Instagram Hop! The watercolor wash is so amazing! Great card. Love the colours and layout of the card, so effective. I love white embossing on black cardstock, it really pops. Nice card! Lovely! I love the grey between white layers! Awesome card with a pretty background! 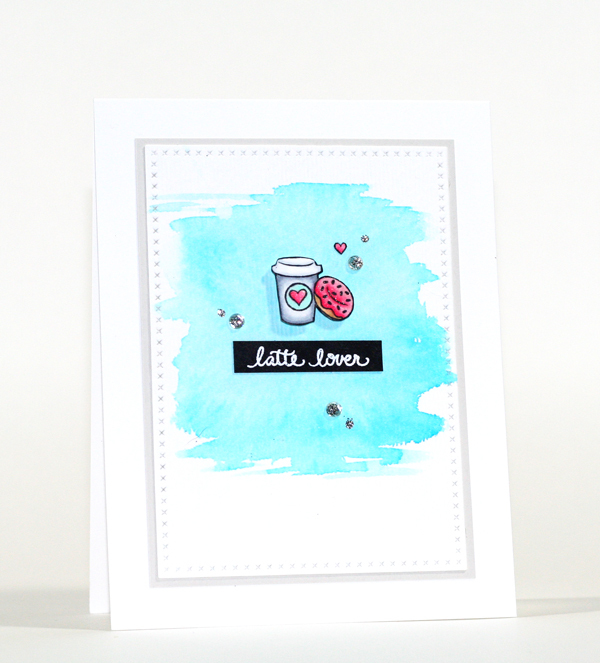 Love the Coffee and Donut stamp! So cute! Aahhh, my favorite morning breakfast. 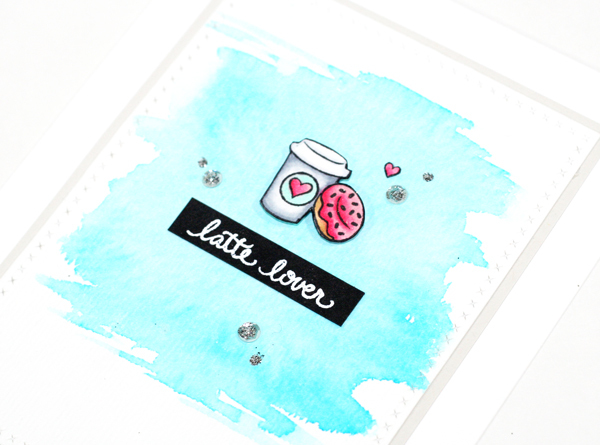 Love your watercolor background and cute stamps. Adorable! Love the watercoloring in the background and the bold sentiment label!! Awesome work! Awesome card! Love the use of the watercolors!